There are three big tools for breaking down the barriers to community renewable energy: using non-tax-based incentives for renewable energy, simplifying the process of raising capital, and adopting formal “community energy” laws that enable power sharing. The impact of adoption could be enormous. In the community solar market alone, the National Renewable Energy Laboratory estimates that residential and commercial customers who can’t have their own rooftop solar array could be participants in 5,500 to 11,000 megawatts of solar (a 22 to 44% increase over the total installed base) by 2020 with the right rules in place. Below is part two of our Beyond Sharing Report, a report released in April 2016 about how community-owned renewable energy can capture renewables’ economic power. Be sure to read part one, and stay tuned for part three early next week. There are two solutions to the federal tax incentive problem for community renewable energy projects. One is to change federal incentives so they do not favor taxable over nontaxable entities. For example, Congress could opt to offer the incentive as a cash grant, as it did during the financial crisis (2009-2011). Later, we feature two examples of community wind projects enabled by this time-limited opportunity. 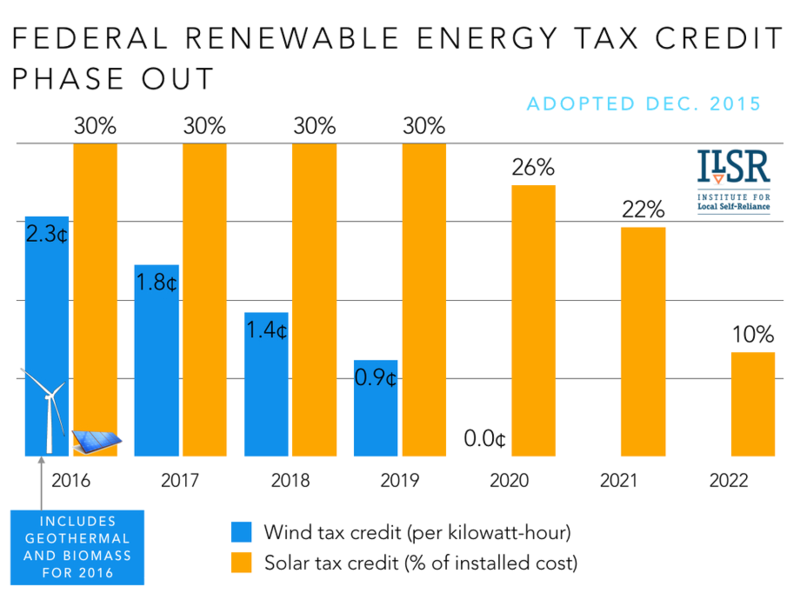 Although the tax credit for both wind and solar remarkably won extension in late 2015, its design wasn’t improved relative to non-taxable entities. This is in part because the rules of legislating typically require a single Congressional approval for tax credits, but at least two votes for cash payments: authorization and appropriation. Political simplicity means greater financial complexity for community ownership. The second solution to the unequal incentive problem is to move to low cost financing rather than relying on tax incentives. The 2015 federal tax credit extension already includes a scheduled phase out (shown below), by 2020 for wind, geothermal, and biomass projects and by 2023 for solar. This eventual expiration may reduce the disincentive toward public and community ownership structures because developers (community or otherwise) will no longer have to seek Wall Street “tax equity” partners to absorb the tax incentives. Such partnerships have been expensive. 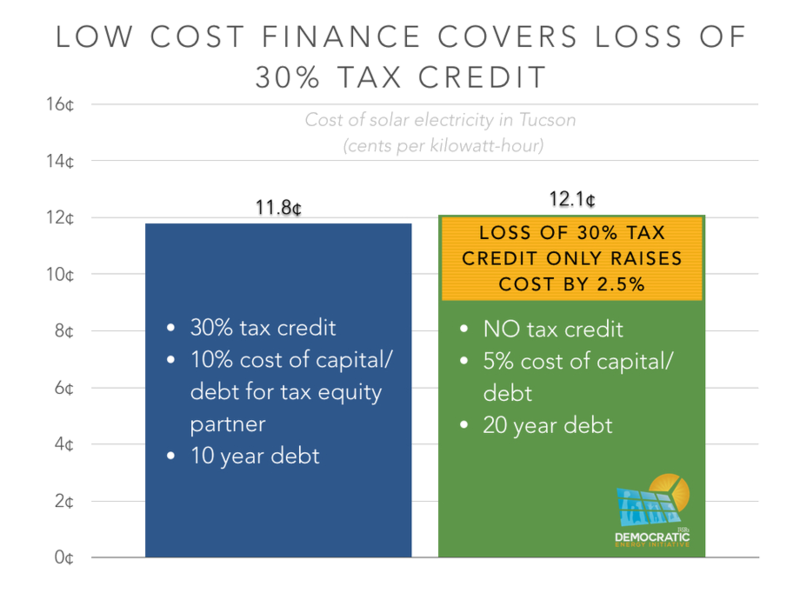 The following chart shows how losing the 30% residential solar tax credit would only increase the cost of solar energy by 2.5%, if by forgoing tax equity partners the residential solar developer can access debt or equity at 5% interest instead of 10%. The assumption is that without a tax equity market (limited by the number of potential investors and their ability to demand high returns), financing for solar would be taken up by more conservative, institutional investors with an eye toward stable and less lucrative long-term returns. Although phasing out incentives for wind and solar unfairly gives fossil fuel power plants an economic advantage (despite their significant and unaccounted for environmental cost), it may result in more diverse renewable project ownership structures. In 2012, a California-based organization called Solar Mosaic garnered significant attention with its launch of crowd financing for community-based solar projects. Mosaic’s platform allowed ordinary folks in California and New York, and accredited investors everywhere, to make a modest (4 to 6%) investment return on community-based solar installations in their state, with the company expected to expand to other states. By 2014, Mosaic had expanded to two dozen projects and over 3,000 investors, supporting a variety of projects on private and community buildings, such as a youth employment center in Oakland, CA, and a convention center in Wildwood, NJ. It had yet to use crowd-sourced dollars to support community-owned solar, but Mosaic president Billy Parish expressed interest in the idea in this 2014 podcast with ILSR’s John Farrell. Concurrent with Mosaic’s rise in prominence, the federal government passed the JOBS Act, promising a new way for small groups of ordinary people to pool their money to invest in renewable energy (and many other kinds of) projects. The excitement of crowd finance in those years makes the ensuing silence much more profound. Sometime in 2015, Mosaic changed strategy to finance individual residential, rather than community-based, installations. Investors could still make a return, but by providing low-interest loans (5% over 20 years) to individuals for solar on their own property, to promote ownership rather than leasing. And the federal rules? Draft rules were released for comment in October 2013, but not finally adopted until October 2015, with an additional 6-month delay until implementation. The adopted rules promise to less onerous compliance rules for small dollar projects, and an avenue for ordinary investors to participate (more detail in the Appendix). On the whole, the rules may not provide much advantage over existing exemptions from federal crowdfunding rules, other than allowing interstate investment. And the state rules have been in place, sometimes for several years, while the federal government was evaluating its rules. 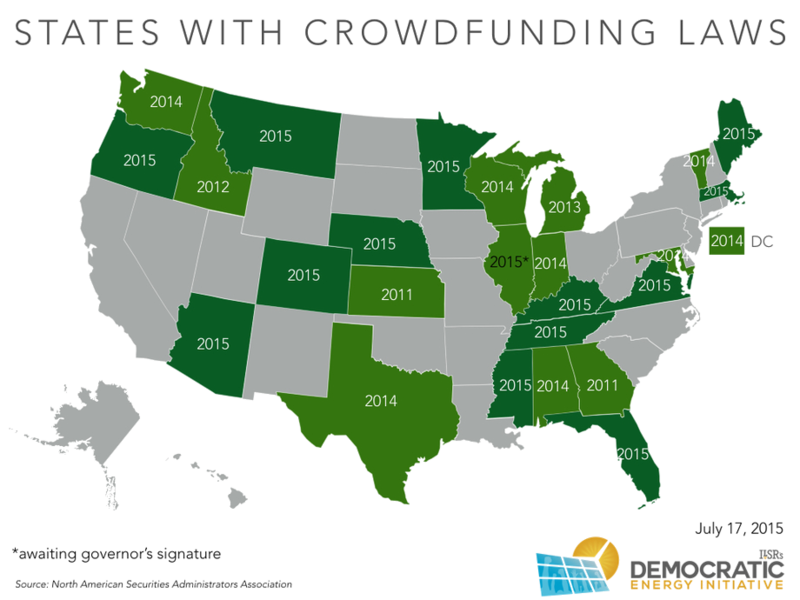 Many state level crowdfunding laws, based on existing exemptions from federal oversight, were implemented while the federal rules were bogged down. Through 2015, 25 states plus the District of Columbia adopted rules to simplify financing for small projects (see map below). The adopted state laws (more detail in the Appendix) have very similar terms to the recently adopted federal crowdfunding rules. Despite the more rapid adoption of policies, the state crowdfunding programs haven’t scaled up quickly. According to the New York Times, through June 2015 just 95 companies successfully raised capital using state-based crowdfunding laws despite being available in half of U.S. states. The lone exception to the general malaise of crowd financing community renewable energy is the donation model. Oakland-based RE-VOLV has a unique offer: a “pay-it-forward” contribution. So far, 765 donors have made over $120,000 in tax-deductible contributions to fund solar installations on a food cooperative, place of worship, and dance studio. The solar recipients pay nothing upfront, but lease the system from RE-VOLV (paid for by their energy savings). RE-VOLV, in turn, uses the lease revenue as seed money to fund the next community solar project. It’s the “people funded sun pay-it-forward” model, with a promise of accelerating growth as the existing projects continue to help fund future ones. Although crowdfunding has enjoyed significant success when “investors” are making donations, as with Kickstarter (for a variety or products) or RE-VOLV (for solar), there remains significant tension between securities laws to protect investors and the relatively unsophisticated market of community renewable energy projects. The most promising policy for breaking the community renewable energy barrier has been commonly called “shared solar.” In most cases, these projects are owned by the electric utility or third parties, with participants purchasing a “subscription” for a share of the electricity output for a limited time (e.g. 15-20 years). The upside is that a subscription (rather than ownership) limits exposure to risk and simplifies raising capital. Subscribers don’t have to process or manage filing for tax incentives, and shares can be purchased for as little as $250. Furthermore, the subscriber model insulates projects from securities law limitations because instead of being investors, subscribers are essentially pre-paying for electricity that will be credited to their bill. This upside is also the downside: shared solar projects are not collective ownership. 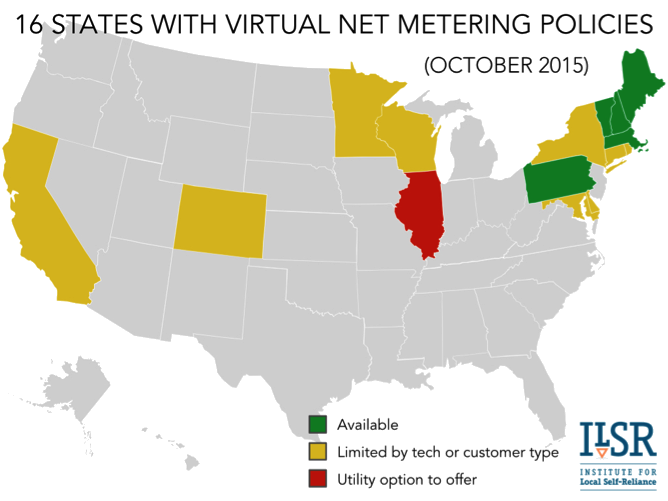 Unless a utility offers a program voluntarily (typically one in which they own the solar array), shared solar is enabled by virtual net metering or explicit community solar laws.33 Most of the 16 states with such laws restrict availability to solar energy and many limit availability to municipal governments or select electric customers. The following map illustrates. The map below shows the success of implementing good state policy. Most existing community solar programs overlap with favorable state policy regimes. Washington is an interesting exception, where the state lacks a virtual net metering policy, but has a history of a very generous state tax incentive for community-owned solar that spawned a number of projects. Although much more likely there, community shared solar projects aren’t limited to states with adopted policies. A number of utilities—particularly rural electric cooperatives—have offered community solar projects to their customers in other states including Georgia, Iowa, Michigan, and North Carolina. New policies are also under active consideration in New Mexico and Virginia. Hawaii enacted a law in 2015, and its program launch is awaiting a “value of solar” determination after an initial (poorly designed) utility program was shut down by the state’s Commission. 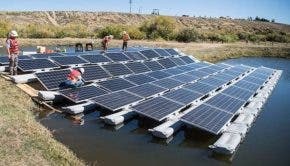 Colorado company Clean Energy Collective has pioneered the development of a shared solar model that has been successful across eight states and even more utilities. The company sells 50-year ownership shares in community solar projects arranged in partnership with the hosting electric utility. The for-profit company is able to capture and pass through the federal tax credit, thereby lowering the cost of purchasing or financing a share of ownership. Perhaps its biggest contribution is solving the issue of sharing electricity output by negotiating arrangements with utilities that are not compelled by law. Their community solar offerings may also offer a discount relative to individual ownership, for those who have the option. In a recent project developed for the Wright-Hennepin electric cooperative in Minnesota, for example, the Collective’s community solar project offered a 12-year reduction in payback for a solar investment, from an abysmal 32 years to a still-long 20 years. For more on Clean Energy Collective’s model and business, listen to this 2013 podcast with CEO Paul Spencer. The “Simple Solar” offering by the Cedar Falls, IA, municipal utility is another good illustration. Customers will receive a credit to their electric bill for their share of electricity production, but (unlike with net metering), the energy credit will be based on the “market energy supply costs for the billing period.” Originally much smaller, high demand led the utility to increase the size of the solar project to 1.5 megawatts, and it now has over 1,200 residential and business subscribers. The increased size also drove down the price to $270 per 170 Watt panel ($1.59 per Watt), far less than a comparable individually-owned system (typical installed costs are around $3.00 per Watt). A relatively recent community renewable energy model piloted by a Vermont law clinic may take advantage of electricity sharing laws and avoid securities regulation issues. The model has participants purchase their shares directly from the solar installer, rather than via the community solar organization. Instead of acting as an aggregator of capital, the community solar organization (usually a limited liability company) has a more limited role, and “jointly maintains the array, sharing expenses for insurance, taxes, cutting the grass.” The direct purchase means each individual is shopping separately, not investing collectively, and thus there is no security to advertise. However, the model hinges on the Vermont’s virtual net metering law, allowing each individual to net the production from their share of the community solar array against their home energy use. Aided by new policy, community shared solar is expected to expand rapidly in the next five years. In a report published by the National Renewable Energy Laboratory in April 2015, researchers estimated that shared solar could account for 5 to 11 gigawatts of solar capacity, for residential and non-residential participants, by 2020. With relatively high participation rates (213 participants per megawatt) in early community solar projects, these figures suggest that over a million Americans could participate in shared solar in the next 4 years. The big questions for the subscriber model, aside from falling short of collective ownership, is whether it can meet the other principles for community renewable energy, including tangible benefits, be additive to other renewable energy policies, and ensure access to all. The biggest limitation on shared solar is policy. 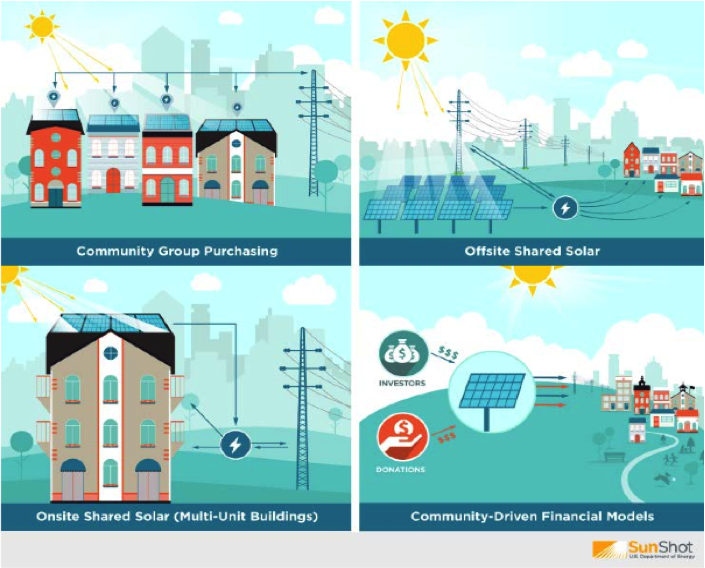 Community shared solar may be simpler than the ownership model, but to be developed by anyone other than the utility company, it requires utility cooperation (e.g. such as Clean Energy Collective) or enabling state legislation. Be even where implemented, shared solar has room for improvement. For one, shared solar programs should always offer ownership options beyond utility ownership, and program rules should facilitate collective ownership where possible. In most cases, ownership is retained by the utility or a third party, giving the participants little say in the decisions of the community solar project, from hiring to contracts with other local businesses, to the project location. The tradeoff seems relatively inexpensive when tax law limits how much of the tax benefits can be captured locally, but as the incentives fade in prominence, the loss of control may be more than it is worth. Another potential improvement is expanding beyond solar. Community wind projects have proven popular with community ownership, but face many of the same barriers as community-owned solar. Shared renewables policies should be broadened to include non-solar technologies, from wind to geothermal (as district heating, for example) to anaerobic digesters, to provide a workaround for securities limitations. A third place for improvement (in all forms of community renewables, not limited to shared solar) is financing. Especially with early shared solar programs, participants had to pay an upfront cost from several hundred to several thousand dollars to buy a share. Even as the programs have expanded to include financing, only participants with high credit scores are able to access financing. Full deployment of community solar will require financing options that can be accessed by low- and moderate-income households. Some promising options include on-bill repayment of subscription costs via the utility bill, which have much lower default rates than consumer loans, or institutional anchor tenants for community solar projects that are committed to claiming subscriptions of participants who fall short on payments. Despite having a heavy reliance on large-scale fossil fuel generation, rural electric cooperatives have been much more likely to experiment with community solar and tools like on-bill financing to allow member participation. 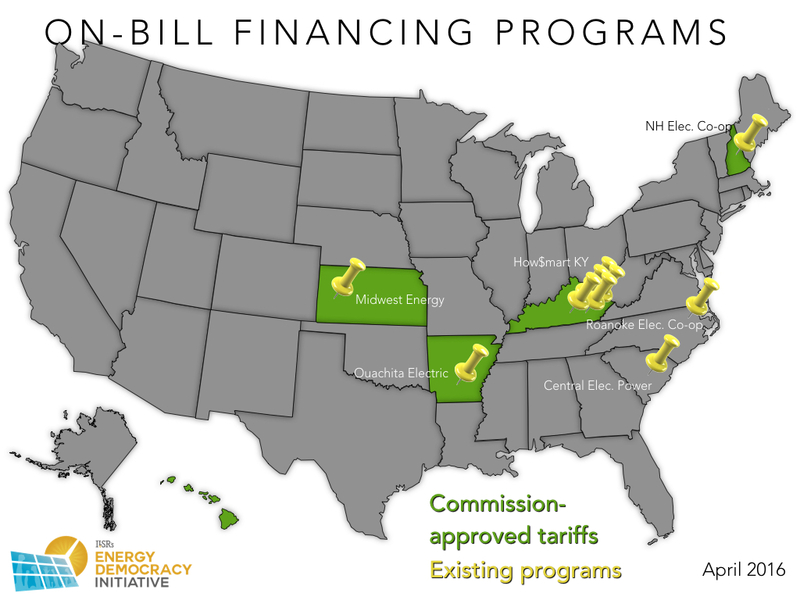 The following map shows active on-bill financing programs, almost entirely provided by rural electric cooperatives. 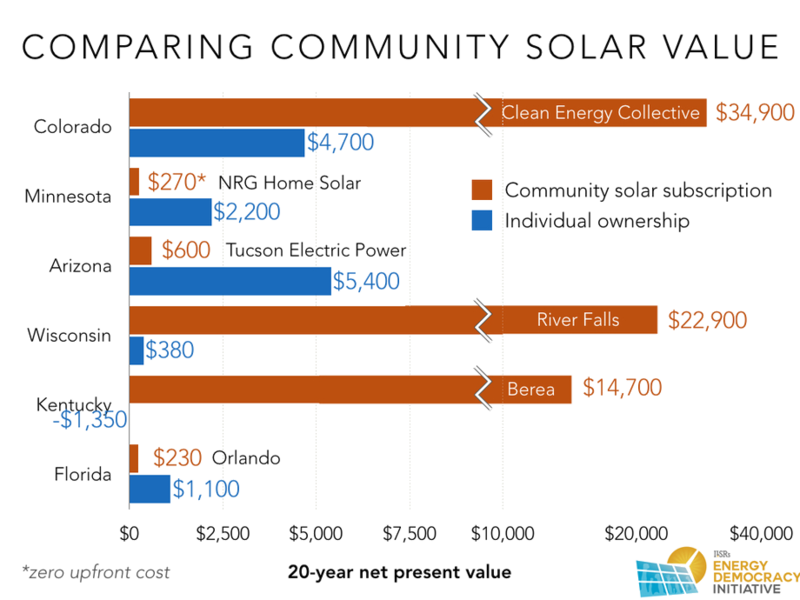 A final issue for shared solar is transparency of participant costs and benefits. Early program and project designs vary widely, leading to wide variance in financial benefits. The following chart compares the 20-year benefits of a 5-kilowatt community solar subscription (top bar of each set, in orange) to a comparable 5-kilowatt customer-owned solar array on their property (bottom bar, in blue). Utility sponsored programs in Arizona (Tucson Electric Power) and Florida (Orlando Public Utilities Commission) create very modest savings, and are less lucrative than an individual having solar on their own roof. In the case of Tucson, the financial benefit is basically a roof rental fee from the utility, far less than the value of reducing energy purchases with a rooftop solar array. In Orlando, the bill credit starts out several cents lower per kilowatt-hour than the retail electricity price, costing the customer more out of pocket until the credit rises above the retail rate in approximately year 10. In contrast, utility-offered programs by municipal utilities in Kentucky and Wisconsin both offer significant benefits over the long term. In both cases, relatively low upfront costs are offset quickly by energy savings, even though the savings rates in both cases are less than 8¢ per kilowatt-hour. In Colorado, where third parties provide community solar, the community solar savings (from Clean Energy Collective, in this case) far outstrip individual panel ownership, because the full retail credit quickly offsets the high upfront cost. In Minnesota, a similar program structure is a strength, with bill credits actually higher than the retail rate due to the inclusion of solar renewable energy credits of 2-3¢ per kilowatt-hour. The savings from the NRG Home Solar program are smaller than for ownership over 20 years because the subscription cost escalates, potentially faster than the bill credit. But with zero upfront cost for credit-worthy customers, it may be more attractive than the modestly higher returns from having a solar-adorned roof. California provides an example of where “shared solar” becomes a lot like “green pricing,” where customers pay a premium for power from community solar. Part of the program is literally that, where customers will be able to green up their electricity supply from utility-owned solar arrays, but will have to pay 15 to 35% more per kilowatt-hour. For the more traditional “shared solar” model, the program is likely to be stymied by bill credits of around 8¢ per kilowatt-hour, far less than the retail electricity prices. Ultimately, shared solar is a relatively new tool with ample opportunity to improve. 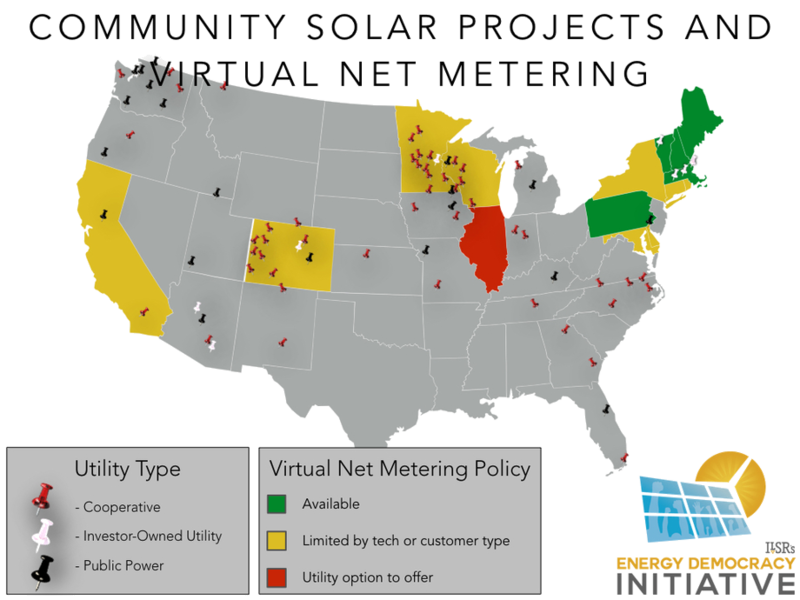 Despite the relatively large number of states with programs and voluntary utility-provided programs, there are just over 100 megawatts of community solar projects online (a tiny fraction of total U.S. electric generating capacity). Acting collectively doesn’t always mean collective ownership, and one successful tool has been to organize individual homeowners and businesses to buy into solar together. The “SUN” chapters of the Community Power Network, for example, organize cooperative associations of homeowners to collectively bid for solar installations on their homes, lowering prices by as much as 25%. The notion was pioneered by the Mt. Pleasant Solar Cooperative in Washington, DC. This local effort helped get solar installed on 10% percent of properties in the neighborhood, and spawned several buying cooperatives in other DC neighborhoods. By 2015, the Network served communities in D.C., Maryland, Virginia, and West Virginia. In total, it has aided low-cost installation of nearly 6.5 megawatts of solar for thousands of participants. Below is our 2013 podcast interview with Anya Schoolman from the Community Power Network. Another example is the “Solarize” model started on the opposite coast, in Portland, OR. “The Solarize approach allows groups of homeowners or businesses to work together to collectively negotiate rates, competitively select an installer, and increase demand through a creative limited-time offer to join the campaign.” Solarize campaigns are now operating in California, Connecticut, Maryland, Massachusetts, New Hampshire, New York, North Carolina, Oregon, Pennsylvania, Rhode Island, Texas, Utah, Vermont, Washington, and Wisconsin. Several of these campaigns are government or utility sponsored and, cumulatively, the various Solarize efforts have installed over 20 megawatts of solar, at a modest price discount to individuals acting alone. For more information on group purchase programs, see the Solarize Guidebook published by the NW SEED in partnership with the National Renewable Energy Laboratory. Another possibility is that community renewable energy projects will become wholesale power providers. In this case, the community-owned project simply sells power into the competitive market, with revenue shared among participants. As more states consider de-monopolizing the distribution grid, in particular, there may be greater opportunities for sales at the local level, replacing the need to share electricity output with a simpler revenue-sharing model. It may seem odd to distinguish between “community” and “cooperative” renewable energy projects. However, “community” can describe geographic or ethnic or simply solar-loving groups of people, whereas a cooperative is a formal legal structure with a history of democratic governance and equitable distribution of benefits. Cooperatives are common in other economic sectors but in electricity are almost entirely represented by decades-old and conservative monopoly rural electric cooperatives. Despite this, the cooperative structure—used to first bring electricity to many communities that would have otherwise gone without—could be last century’s gift to solve this century’s problems of organizing community renewable energy projects. There are unfortunately few examples of cooperatives in the renewable energy field. There are a few are worker-owned cooperatives, owning an enterprise that provides renewable energy services but not developing community renewable energy projects. At PV Squared, a solar installation company in the Pioneer Valley of Massachusetts, the workers make the decisions about the direction of the company and share in the profits. Namaste Solar is also a worker-owned energy services companies, and it is also a part of the Amicus buying cooperative (discussed below) for solar installers. Cooperatives can also pool their buying power for consumers or businesses. Cooperative Community Energy is a member-owned solar and energy services company in California. Members get access to bulk discounts on hardware, the cooperative lobbies for more favorable policy, and members get a dividend check if the cooperative turns a profit. The Acorn Renewable Energy Cooperative in Vermont provides bulk purchase benefits on a variety of renewable resources, including wood chips, heat pumps, and solar. Amicus Solar is a cooperative of dozens of solar installation companies, giving them a collective purchasing power that can compete with the largest installers in the country, without having to merge companies. Cooperative Energy Futures is a small, for-profit cooperative in Minneapolis that has organized households to provide energy efficiency and solar energy services with bulk purchasing. In 2014, they began offering a solar leasing program and in 2016 they plan to offer their first community solar project under the state’s community solar program. Cooperative Community Energy is a full service residential and commercial solar installer cooperative in California. In many European countries, there are hybrid electricity cooperatives where the cooperative owners are consumers of power, but also producers. “In the 1970’s, three rural Danish families banded together and installed a wind turbine, creating the world’s first green energy co-op. Today, the 10,000-member Middelgrunden co-op owns and operates the world’s largest offshore wind farm outside Copenhagen harbour.” Overall, 80% of Danish turbines are cooperatively owned by over 150,000 families. The success of wind cooperatives in Denmark is based on a history of cooperative ownership of utilities and very favorable policy. Beginning in 1979, wind projects could get a 30% capital subsidy, a policy that morphed over time into a fixed payment for production (a feed-in tariff). The fixed payments were supplemented with an income tax exemption (with tax rates exceeding 50%) for revenue from cooperatively-owned wind projects. In the U.S., challenges with accessing renewable energy incentives have meant most “cooperative” ownership models for renewable energy have used limited liability corporations, like MinWind. Not coincidentally, Cooperative Energy Futures is one of the first non-utility cooperatives to develop community renewable energy projects (along with Acorn Renewable Energy Cooperative in Vermont and Vineyard Power in Massachusetts). In addition to solving securities issues, the upside of cooperatives is that they increase the potential community energy project value for participants. In the case of the Shiloh Temple project in Minneapolis (organized by Cooperative Energy Futures), member-subscribers will get electric bill credits but also dividends should the project turn a profit. It’s likely to, since most solar developers offering community solar projects earn a profit on the difference between subscription fees and the project cost, and member-owned Cooperative Energy Futures is both owner and developer. After project debt is retired in the first 10-15 years, the organization may have additional revenue to distribute. Cooperatives won’t automatically solve the challenge of accessing federal tax incentives, although they are at no greater disadvantage to other typically non-taxable entities. For one, cooperatives can act as for-profits, distributing profits (and tax credits) through to members, although this would likely trigger the same passive income barrier mentioned earlier. Cooperatives could also secure a tax equity partner to absorb the tax credits, as have other non-profit organizations. In the next few years, however, the federal tax incentives will sunset, and cooperatives may prove even more advantageous in addressing the remaining barriers. Full report available at ilsr.org. For timely updates, follow John Farrell on Twitter or get the Energy Democracy weekly update. Be sure to read part one here, and stay tuned for part three early next week.